I make no secret of my love for cake. Honestly, who DOESN'T love cake? 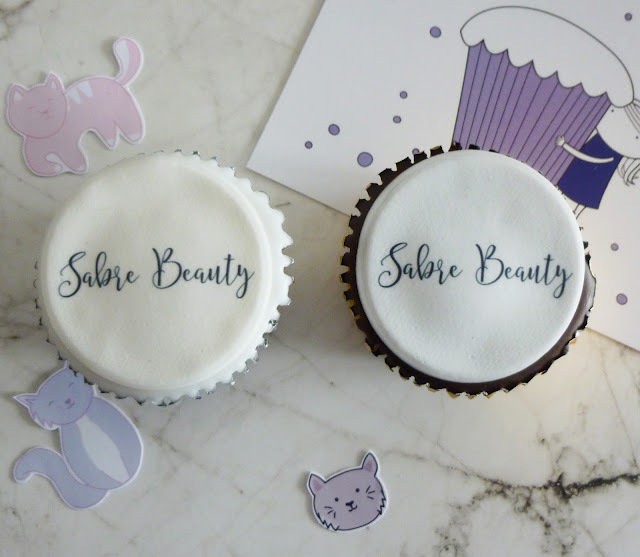 When Caketoppers got in touch and asked me to review their personalised cupcakes, I virtually slapped their hands off! First off, their delivery is ridiculously fast. I ordered them on Tuesday, they were shipped Wednesday, and they arrived Thursday! A + for delivery speed, because I'm so impatient when it comes to waiting for deliveries. They arrived in a fairly small box, securely packaged and bubbled wrapped, with a little 'Best Before' sticker on the package. My postman likes to shake things up and smash stuff, so I'm glad these held up in the post! I think I showed pretty incredible restraint since I didn't get to shove them in my face right away. I didn't have the time, or lighting, to take photos to do the cakes justice. I ended up waiting just under a week before getting to eat them. When I finally got to open them, they still smelled fresh. They were individually wrapped, which is obviously great because the air didn't get to them. Caketoppers sent me a vanilla and a chocolate one to try. Unfortunately, Dave was home sick when I finally got to open them, so he insisted he 'helped me' try them. There was plenty of icing on both cakes, but not too much that it overpowered the sponge, which was light and fluffy like a good cake should be. You can buy Personalised Photo Cupcakes from Caketoppers for as little as £12.99 for a batch of six. Photos are printed directly onto icing and not rice paper, which is a nice touch. They'd make a perfect gift! If you fancy treating yourself, or you know someone who'd love a photo of their face on a cake, use the code SAB10 to get a cool 10% off ! As if you need a better reason to eat cake. I need more cake with my name on in my life! STAT!